21 November 1783: At approximately 2:00 p.m., Jean-François Pilâtre de Rozier and François Laurent le Vieux d’Arlandes (Monsieur le Marquis d’Arlandes) departed Château de la Muette, the home of Louis XVI and Marie-Antoinette near the Bois de Boulogne in the western outskirts of Paris, aboard a hot air balloon which had been designed and built by the brothers Joseph-Michel Montgolfier and Jacques-Étienne Montgolfier. De Rozier had made several tethered ascents previously, learning to control the balloon. On this, the first manned, untethered ascent, de Rozier and Marquis d’Arlandes rose to an altitude of approximately 3,000 feet (910 meters) and drifted to the southwest. After about 25 minutes, they descended to land between two windmills outside the city, at Butte-aux-Cailles. They had traveled about five miles (nine kilometers). They could have flown farther, but the embers from the fire were beginning to scorch the balloon. The Montgolfier brothers were the sons of a paper maker. They combined with Jean-Baptiste Réveillon, a wallpaper manufacturer, to construct their balloon envelopes of taffeta (a woven silk fabric) coated by an alum/varnish mixture. The balloon flown by de Rozier and the Marquis d’Arlandes had an approximate volume of 60,000 cubic feet (1,699 cubic meters). It was approximately 75 feet (22.86 meters) tall with a diameter of 50 feet (15.24 meters). The air within the balloon was heated by burning coals. This resulted in a pressure differential: the heated air was less dense than the ambient air. This caused the balloon to rise. 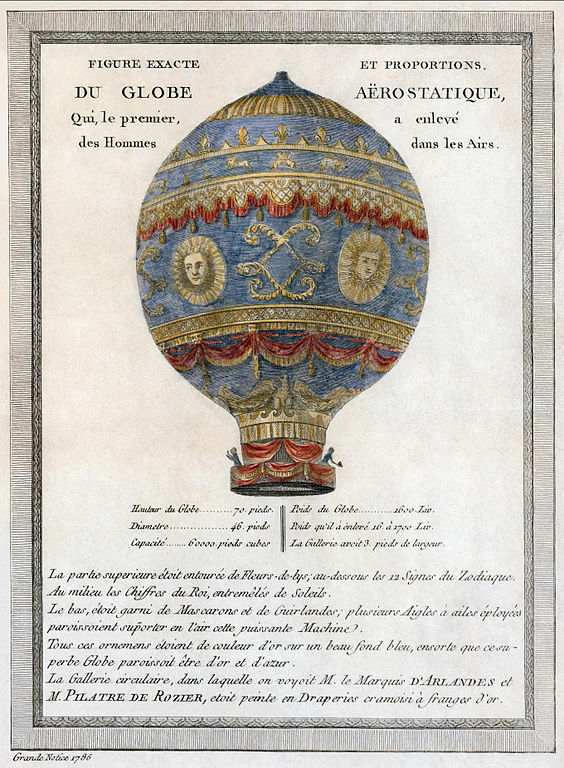 A 1786 illustration of the Montgolfier brothers’ hot air balloon, flown by de Rozier and M. le Marquis d’Arlandes, 21 November 1783. 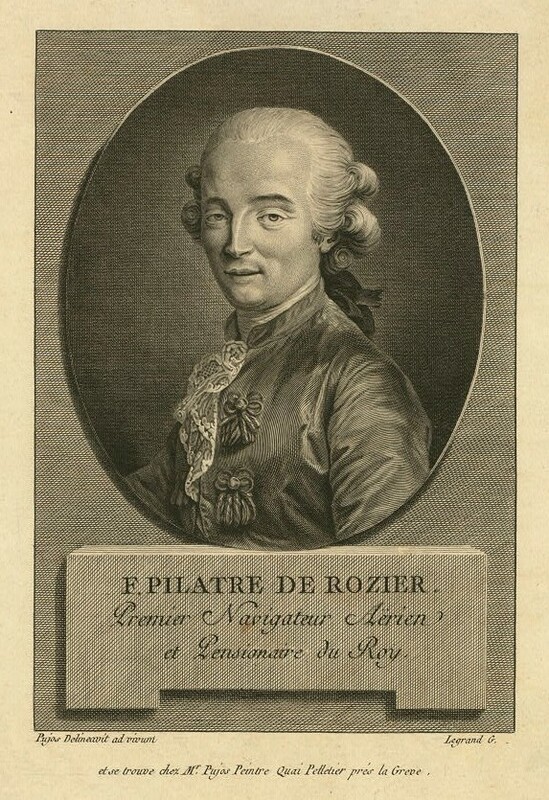 Jean-François Pilâtre de Rozier was killed 15 June 1785, while attempting to cross the English Channel in a hydrogen balloon along with Pierre Romain. Adverse winds blew him back onshore, but for unknown reasons, the balloon collapsed and fell approximately 1,500 feet (457 meters) to the ground near Wimereux, Pas-de-Calais. 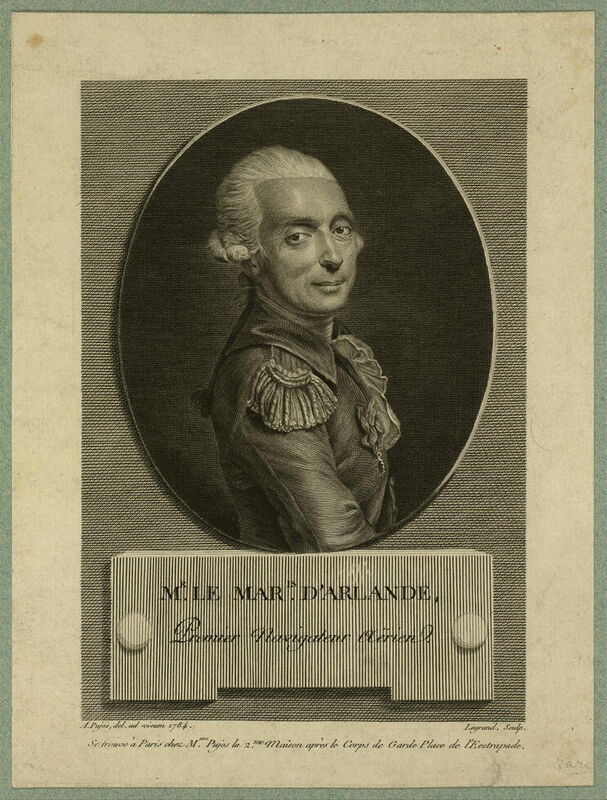 François Laurent le Vieux d’Arlandes died in 1806, possibly committing suicide.